In 2009, a record 205 nominations were received, but the record was broken again in 2010 with 237 nominations; in 2011, the record was broken once again with 241 nominations. 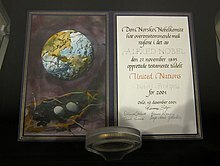 The statutes of the Nobel Foundation do not allow information about nominations, considerations, or investigations relating to awarding the prize to be made public for at least 50 years after a prize has been awarded. 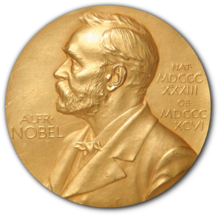 Over time, many individuals have become known as "Nobel Peace Prize Nominees", but this designation has no official standing, and means only that one of the thousands of eligible nominators suggested the person's name for consideration. Indeed, in 1939, Adolf Hitler received a satirical nomination from a member of the Swedish parliament, mocking the (serious but unsuccessful) nomination of Neville Chamberlain. Nominations from 1901 to 1956, however, have been released in a database. The Chairman of the Norwegian Nobel Committee presents the Nobel Peace Prize in the presence of the King of Norway on 10 December each year (the anniversary of Nobel's death). The Peace Prize is the only Nobel Prize not presented in Stockholm. The Nobel laureate receives a diploma, a medal, and a document confirming the prize amount. As of 2013[update], the prize was worth 10 million SEK (about US$1.5 million). 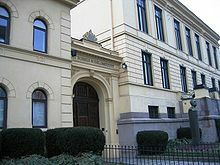 Since 1990, the Nobel Peace Prize Ceremony is held at Oslo City Hall. In another 2011 Aftenposten opinion article, the grandson of one of Nobel's two brothers, Michael Nobel, also criticised what he believed to be the politicisation of the award, claiming that the Nobel Committee has not always acted in accordance with Nobel's will. Norwegian lawyer Fredrik S. Heffermehl has criticized the management of the Peace Prize. The awards given to Mikhail Gorbachev, Yitzhak Rabin, Shimon Peres, Menachem Begin and Yasser Arafat, Lê Đức Thọ, Henry Kissinger, Jimmy Carter, Al Gore, the IPCC, Liu Xiaobo, Aung San Suu Kyi, Barack Obama, and the European Union have all been the subject of controversy. The awards given to Lê Đức Thọ and Henry Kissinger prompted two dissenting Committee members to resign. Thọ refused to accept the prize, on the grounds that such "bourgeois sentimentalities" were not for him and that peace had not actually been achieved in Vietnam. Kissinger donated his prize money to charity, did not attend the award ceremony and later offered to return his prize medal after the fall of South Vietnam to North Vietnamese forces 18 months later. Foreign Policy has listed Mahatma Gandhi, Eleanor Roosevelt, U Thant, Václav Havel, Ken Saro-Wiwa, Fazle Hasan Abed and Corazon Aquino as people who "never won the prize, but should have". The omission of Mahatma Gandhi has been particularly widely discussed, including in public statements by various members of the Nobel Committee. The Committee has confirmed that Gandhi was nominated in 1937, 1938, 1939, 1947, and, finally, a few days before his assassination in January 1948. The omission has been publicly regretted by later members of the Nobel Committee. Geir Lundestad, Secretary of Norwegian Nobel Committee in 2006 said, "The greatest omission in our 106-year history is undoubtedly that Mahatma Gandhi never received the Nobel Peace prize. Gandhi could do without the Nobel Peace prize, whether Nobel committee can do without Gandhi is the question". In 1948, following Gandhi's death, the Nobel Committee declined to award a prize on the ground that "there was no suitable living candidate" that year. Later, when the Dalai Lama was awarded the Peace Prize in 1989, the chairman of the committee said that this was "in part a tribute to the memory of Mahatma Gandhi". For a more comprehensive list, see List of Nobel Peace Prize laureates. As of 2016[update], the Peace Prize has been awarded to 104 individuals and 23 organizations. Sixteen women have won the Nobel Peace Prize, more than any other Nobel Prize. Only two recipients have won multiple Prizes: the International Committee of the Red Cross has won three times (1917, 1944, and 1963) and the Office of the United Nations High Commissioner for Refugees has won twice (1954 and 1981). Lê Đức Thọ is the only person who refused to accept the Nobel Peace Prize. ^ "The Nobel Peace Prize 1901". www.nobelprize.org. Retrieved 2017-10-29. ^ "The Nobel Peace Prize 1901". NobelPrize. 1972. Archived from the original on 2007-01-02. Retrieved 2016-03-19. ^ "Excerpt from the Will of Alfred Nobel". Nobel Foundation. Retrieved 31 March 2008. ^ Nordlinger, Jay (2012-03-20). Peace, They Say: A History of the Nobel Peace Prize, the Most Famous and Controversial Prize in the World. Encounter Books. ISBN 9781594035999. ^ Levush, Ruth (2015-12-07). 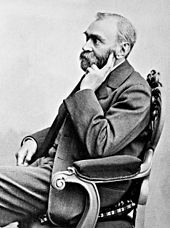 "Alfred Nobel's Will: A Legal Document that Might Have Changed the World and a Man's Legacy | In Custodia Legis: Law Librarians of Congress". blogs.loc.gov. Retrieved 2019-03-12. ^ a b "Why Norway?". The Norwegian Nobel Committee. Retrieved 11 October 2009. ^ Altman, L. (2006). Alfred Nobel and the prize that almost didn't happen. New York Times. Retrieved 14 October 2006. ^ "Nomination for the Nobel Peace Prize". Nobel Foundation. Archived from the original on 30 August 2009. Retrieved 10 September 2009. ^ a b "Who may submit nominations?". The Norwegian Nobel Committee. 8 October 2017. Archived from the original on 30 June 2013. Retrieved 10 September 2009. ^ "President Barack Obama wins Nobel Peace Prize". Associated Press on yahoo.com. Retrieved 9 October 2009. ^ "Nominations for the 2011 Nobel Peace Prize". Nobel Foundation. Archived from the original on 11 October 2011. Retrieved 7 October 2011. ^ "Nominations for the 2009 Nobel Peace Prize". The Norwegian Nobel Committee. Archived from the original on 21 September 2009. Retrieved 11 October 2009. ^ "Who may submit nominations – Nobels fredspris". Retrieved 10 October 2014. ^ Merelli, Annelise. "The darkly ironic 1939 letter nominating Adolf Hitler for the Nobel Peace Prize". Qz.com. Quartz Media. Retrieved 10 November 2017. ^ "Nomination Database – The Nobel Peace Prize, 1901–1956". Nobelprize.org. Retrieved 11 September 2011. ^ "How are Laureates selected?". The Norwegian Nobel Committee. Archived from the original on 31 August 2009. Retrieved 10 September 2009. ^ What the Nobel Laureates Receive Archived 30 October 2007 at the Wayback Machine. nobelprize.org. ^ "Prisutdelingen | Nobels fredspris". Nobelpeaceprize.org. Archived from the original on 4 November 2012. Retrieved 13 October 2012. ^ a b "Obama Peace Prize win has some Americans asking why?". 9 October 2009 – via Reuters. ^ "Obama's peace prize didn't have desired effect, former Nobel official says". Associated Press. Retrieved 17 September 2015. ^ Murphy, Clare (10 August 2004). "The Nobel: Dynamite or damp squib?". BBC online. BBC News. Retrieved 11 October 2009. ^ Aspøy, Arild (4 October 2011). "Fredsprisens gråsoner". Aftenposten (in Norwegian). p. 4. Nobelkomiteen bør ta inn medlemmer med faglig og internasjonal bakgrunn... som gjøre en like god jobb som pensjonerte stortingsrepresentanter. ^ Nobel, Michael (9 December 2011). "I strid med Nobels vilje". Aftenposten (in Norwegian). Oslo, Norway. Retrieved 12 December 2011. ^ "Gorbachev Gets Nobel Peace Prize For Foreign Police Achievements". The New York Times. 16 October 1990. ^ "Worldwide criticism of Nobel peace awards". The Times. London. 18 October 1973. Retrieved 11 October 2009. ^ "A Nobel Disgrace". National Review Online. 22 September 2009. Retrieved 2 October 2011. ^ "Nobel Peace Prize nominations show how 'hopelessly politicized' and 'screwy' the controversial award has been". 14 February 2014. Retrieved 23 April 2014. ^ "Overseas Chinese in Norway Protest Against Nobel Committee's Wrong Decision". English.cri.cn. Retrieved 13 October 2012. ^ "Not so noble". Frontlineonnet.com. 5 November 2010. Retrieved 13 October 2012. ^ "Nobel Harbors Political Motives behind Prize to Liu Xiaobo". English.cri.cn. Retrieved 13 October 2012. ^ Monbiot, George (5 September 2017). "Take away Aung San Suu Kyi's Nobel peace prize. She no longer deserves it". The Guardian. Retrieved 2017-11-12. ^ Kristof, Nicholas (9 September 2017). "A Nobel Peace Prize Winner's Shame". The New York Times. Retrieved 2017-11-12. ^ Taylor, Adam (9 September 2017). "Why Aung San Suu Kyi is unlikely to have her Nobel Peace Prize revoked". The Washington Post. Retrieved 2017-11-12. ^ "Nobel chief regrets Obama peace prize". 17 September 2015 – via www.bbc.com. ^ "Surprised, humbled Obama awarded Nobel Peace Prize". Associated Press. Archived from the original on 9 October 2009. Retrieved 9 October 2009. ^ "Obama Peace Prize win has some Americans asking why?". Reuters.com. 9 October 2009. Retrieved 28 August 2012. ^ "Norwegian protesters say EU Nobel Peace Prize win devalues award". Retrieved 8 December 2012. ^ Tønnesson, Øyvind (29 June 2000). "Controversies and Criticisms". Nobelprize.org. Retrieved 27 February 2010. ^ James, Frank (9 October 2009). "Nobel Peace Prize's Notable Omissions". NPR. Retrieved 12 December 2011. ^ a b Tønnesson, Øyvind (1 December 1999). "Mahatma Gandhi, the Missing Laureate". The Nobel Foundation. Retrieved 17 October 2007. ^ "The Nomination Database for the Nobel Peace Prize, 1901–1956: Gandhi". Nobelprize.org. Retrieved 13 October 2008. ^ "Presentation Speech by Egil Aarvik, Chairman of the Norwegian Nobel Committee". Retrieved 10 October 2014. ^ "Women Nobel Laureates". Nobel Foundation. Retrieved 2011-10-06. ^ "Nobel Laureates Facts". Nobel Foundation. Archived from the original on 2012-09-01. Retrieved 2011-10-06. ^ Rothman, Lily. "Why a Nobel Peace Prize Was Once Rejected". TIME.com. Retrieved 2016-10-16.